Admittedly Family Guy has gone off the boil pretty spectacularly over the last couple of years, but every now then they still absolutely nail it. 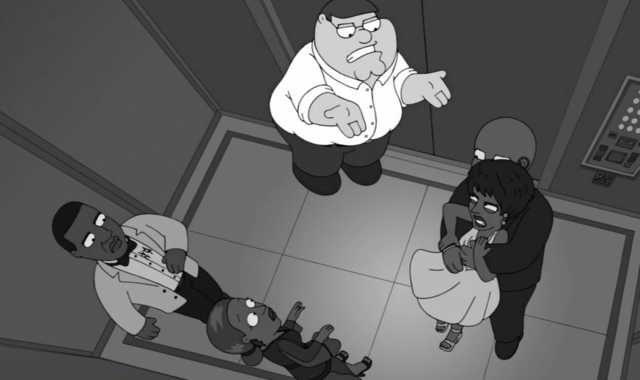 And last week, in a timely reminder of the infamous ‘elevator incident’ Peter recalls the time he found himself in a lift with Jay Z, Solange, and Beyoncé, reports Complex. In one of the desperately overused ‘cutaways’ Peter looks on as Solange repeatedly lunges at Jay and gives some standard Peter Griffin commentary. The actual elevator incident took place at the Met Gala in 2014. Jay, Beyoncé, and Solange all got into an elevator on their way to an after-party at the Standard Hotel in New York City when the ‘dispute’ was caught on CCTV. They quickly released a joint statement saying they had ‘put it behind them’ and that Jay and Solange each assume their share of responsibility for what occurred. They both acknowledge their role in this private matter that has played out in the public. They both have apologised to each other and we have moved forward as a united family.